If you’re looking for a cute top for summer, this really pretty Embroidered Top is one you’re going to want in your closet. Right now, you can get this on sale for $32 (reg. $59). This embroidered top will quickly become your favorite. The details and embroidery on this top are amazing, and it has a fit that gently drapes with plenty of ease, making it flattering on any body type. This is the perfect top to wear with anything from your favorite jeans to dressy pants or a pencil skirt for something dressier. This is one top you’re going to want in both colors! Cast iron pan lovers – you’re in luck! 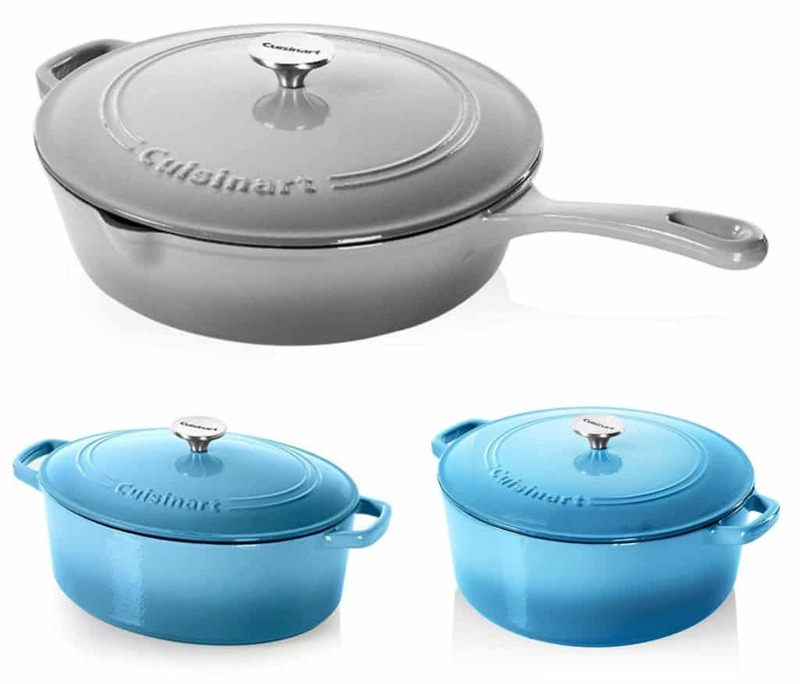 There is a new sale on Cuisinart Cast Iron Cookware pots and pans! There are three styles available and two gradiant colors to choose from. You’ll be able to buy the 7 quart Cast Iron Casserole Dish, 5.5 quart Cast Iron Casserole Dish and the 12″ Cast Iron Chicken Fryer at a discount. All three are available in blue gradiant or gray gradiant. I am really loving the blue color! We cook with cast iron pans a lot in our house. We love how the food tastes, and it cooks so much better than in regular pans. We mae a lot of chicken and veggies in our cast iron cookware, and I’ve heard that steak is amazing in in as well. This cookware will be your favorite. It heats up a lot better than regular pans, and it distributes the heat better. You can also use these on the stove as well as in ovens and broilers. Don’t miss out on this Cuisinart Cast Iron Cookware while it’s on sale today! If you’ve been looking for a cute, insulated tumbler cheaper than you’ll find on Etsy, you are going to want to jump on this deal! Right now, you can get 30 oz Designed Insulated Tumblers for just $19! There are several super cute patterns available like campers, pink flamingos, tropical, floral cactus and more. These tumblers are awesome because they keep cold drinks cold for at least 12 hours and do wonders with warm liquids also. They’re super durable and very cute, and people are going to ask you where you got them!